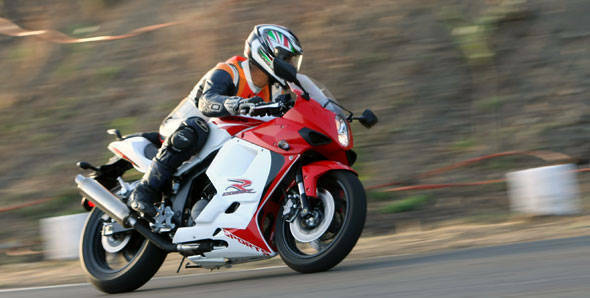 Globally 250cc sportsbikes are regarded as learner motorcycles and are only a step-up for someone relatively new to two wheelers. However in a country like ours where fuel efficiency and small, single-cylinder engined motorcycles reign supreme, 250cc bikes are even today looked upon as performance motorcycles. Personally I have always believed that a 250cc, twin-cylinder is a perfect entry level sportsbike given the increasing number of enthusiasts in the country. 250cc motorcycles are the next big thing and countries like Thailand and Malaysia are proof of this. They pack enough punch to excite novice riders and can be enjoyed by fairly experienced riders as well. But unfortunately our manufacturers are yet to understand the potential the segment holds and even today we have only two of these on sale. So when a third one enters the market, do I need to tell you we are excited? Enter the Hyosung Comet, aka GT250R, a motorcycle with which Garware Motors is hoping to cater to the increasing demand for affordable performance and make itself a more popular name in the Indian motorcycle industry. Remember the 250cc naked Comet that was sold in limited numbers through the erstwhile Kinetic Motors? This is the fully-faired version of the same motorcycle. Though it is really difficult to find similarities between the two bikes in terms of styling, the only element carried over perhaps is the fuel tank, which is the same as the naked (and the GT650R). The GT250R is styled identical to the GT650R and hence impresses with its styling. And that's what this bike is best at  posing. The GT250R gives the impression of being much larger than a 250 and looks as big as some litre-class superbikes. Styling is aggressive but not state of the art. The 250R uses the same body panels seen on the GT650R. It sports the same vertically-stacked projector headlamps placed in its edgy fairing, with low-set clip-on handlebars mounted below the top triple clamp and looks super sporty but not svelte. The split seat, side panels, rear seat cowl, LED tail light, split grab rail are all from the GT650R as well. Overall the GT250R looks appealing from most angles and will impress those looking for a flashy motorcycle. And the two-tone red-white paint job our test bike wore made it eye-catching. Paint quality is good and panels are finished well but uneven panel gaps play spoil sport. Quality of some of the plastics isn't too impressive either, especially on the switch gear and the clocks. The frame is similar to the GT650R's as well and is again larger than needed on a 250 resulting in yawning gaps between the engine and the frame. We would have expected Hyosung to downsize the body panels and make them suitable for the 250, since in its current form the GT250R looks a lot bulkier than we'd expect for a current 250. The GT250R is mechanically similar to the original Comet, albeit with a fuel injection system that it received internationally in 2008. It sports a 249cc, air/oil-cooled 75-degree V-twin engine with an eight-valve, DOHC set-up. Peak power output is 27.88PS at 10,000rpm, while maximum torque stands at 22.07Nm produced at 8000rpm. Thumb the starter and the engine is quick to come to life and settles into the typical V-twin burble. It feels smoother compared to the GT650R's engine but we felt there's still room for improvement. It sounds quite muted as well and we would have really wanted the all-steel exhaust to release some more decibels. 27.88PS sounds promising on paper but power delivery feels sluggish. Fuel injection isn't very smooth either and feels snatchy, especially at low revs. There's a distinct lack of poke low down and you really need to rev the bike hard to accelerate quickly. Revs climb easily but the bike does not accelerate as quickly in return. Rev it harder and the engine feels strained at the top, but that's where it makes most of its power. Redline on the tachometer is at 10,500rpm but the bike continues pulling beyond before hitting its redline at 11,500rpm. The Comet uses a five-speed gearbox with the universal, one-down, four-up shift pattern. Shift quality leaves something to be desired, and demands more effort than expected. Gear ratios feel adequate for the city and highway though, without the need to shift down too often in either environment. In our performance tests the Comet managed to hit 100kmph from standstill in 10.21 seconds, which is not very impressive for a 250. The culprit apart from its power delivery is the Comet's hefty kerb weight of 188kg. Top speed achieved was 146.2kmph, but the Comet took a really long time to achieve this. The quarter mile was completed in 17.53 seconds at 119.67kmph. Braking from the 300mm twin discs at the front feels good at low speeds but at high speeds the brakes lack bite. During the braking test the Comet came to a full stop from 100kmph in 6.2 seconds, covering 58.3 metres in the process - that's a long stop. Fuel efficiency is decent and the Comet returned 34.52kmpl on the highway, the figure dropping to 28.83kmpl in the city. Ride quality is good and despite the suspension set-up being on the stiffer side, it soaks undulations rather well. The suspension set-up feels sporty and encourages corner-carving but the bike's heavy front end and weight spoil the party. The Comet as a result is slow to change direction and even once tipped over is reluctant to come back up quickly. However, grip from its Shinko tyres is impressive. These in combination with the 41mm non-adjustable upside-down forks and the long 1435mm wheelbase give it impressive stability around corners. The committed riding position makes you lean way forward to reach out to the handlebars, which should feel good on a race track, but does not suit city commuting quite as much. The heavy front end also robs the bike of the agility you expect in the city, while the super-committed riding position makes for a really large turning radius. In fact, when making u-turns on the right hand side, the handlebar almost touches the fuel tank and as a result opening the throttle in this position is not very easy. The seat could have been softer as well. All this makes riding the Comet for extended hours quite a task. The Hyosung Comet GT250R comes across as a potent 250cc sportsbike but in its current form feels more apt for relatively inexperienced riders, lacking the fun factor and zing you expect. With its attractive styling and big-bike feel the Comet is sure to appeal to those looking for a flashy-looking motorcycle. But to appeal to the serious enthusiast, Garware Motors really need to up the game. They need to smoothen out the rough edges, apart from improving the bike's performance to get the attention of the discerning buyer. The Hyosung GT250R price in India is Rs 2.75 lakh ex-Delhi, which is a huge premium over the Honda CBR250R, which betters the Comet in several aspects. The Comet feels closer to the highly acclaimed Kawasaki Ninja 250R in pricing.